CARPER, DR. WILLIAM M. -- As a single man he was issued a headright certificate for one-third of a league of land by the Board of Land Commissioners for Harrisburg County in 1838. Having married he was given Headright Certificate NO. ? for two-thirds of a league and one labor land by the Harrisburg Board, December 7, 1839. In this certificate it is stated that he came to Texas in 1835. Dr. Carper was surgeon on the staff of the command at San Jacinto and on September 28, 1849 was issued Donation Certificate No. 175 for 640 acres of land for having participated in the battle. He received Bounty Certificate No. 3776 for 1280 acres of land for serving in the army from March 9, 1836 to June 18, 1837. He sold the certificate to Henry Smith at Houston June 9, 1838 for $250. Dr. Carper practiced medicine in Houston for several years. On April 8, 1846 he became one of the founders of the Grand Lodge of the Independent Order of Odd Fellows of Texas. He was married to Sarah Ann Minerva Ward at Houston, May 27, 1839. Mrs. Carper died in Houston May 16, 1841, and was buried in Founders Memorial Park. Dr. Carper was living in Galveston , when he died in 1859, and was nearly blind. CARPER, WILLIAM M. (ca. 1810–ca. 1859). 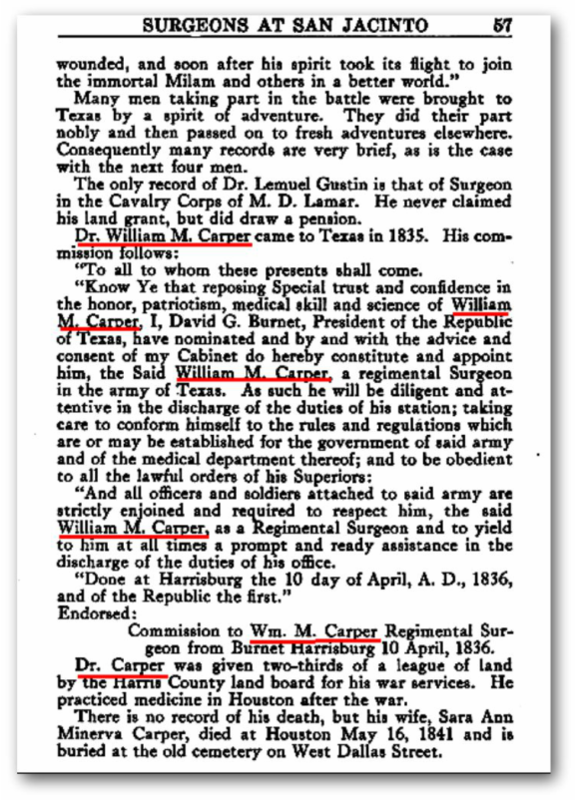 William M. Carper, soldier and physician of the Republic of Texas, was born in Virginia and apparently traveled to Texas because he had been promised a commission in the cavalry, but on April 10, 1836, acting secretary of war David Thomas appointed him a regimental surgeon. Thomas, in a letter to Sam Houston, described Carper as "a gentleman of fine address." At the battle of San Jacinto Carper served as surgeon of Lt. Col. Henry Millard's First Regiment of Regular Infantry. For his military service from March 9, 1836, through June 8, 1837, Carper was issued a bounty warrant for 1,280 acres that he sold to Governor Henry Smith for $250. After the war he located his practice in Houston and was apparently appointed chief of surgeons at the city hospital. On May 28, 1839, he married Sarah Ann Minerva Ward of Houston. That same week he was elected president of the Houston Medical and Surgical Society. On September 23 he was elected to the board of the Houston Post Oak Jockey Club; George Washington Hockley was its president, and Sidney Sherman was first vice president. 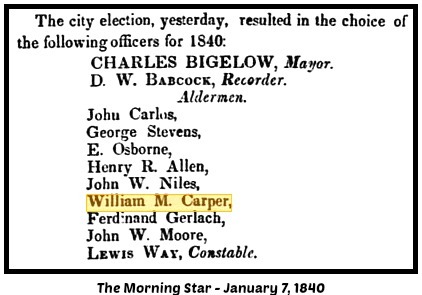 Carper finished third in a four-man race for mayor of Houston in 1841. After only two years of marriage his wife died, on May 16, 1841, at the age of nineteen. In 1850 Carper was living in the Tremont House, Houston, also the residence of his friend Hockley, with a Mrs. Carper, age twenty-four, of Alabama. At the same time he was maintaining a residence in the Rio Grande valley (where he owned $10,000 worth of real estate) with Mary J. D. Carper, age twenty, from Ohio, and a six-month-old orphan named J. W. Crocket. 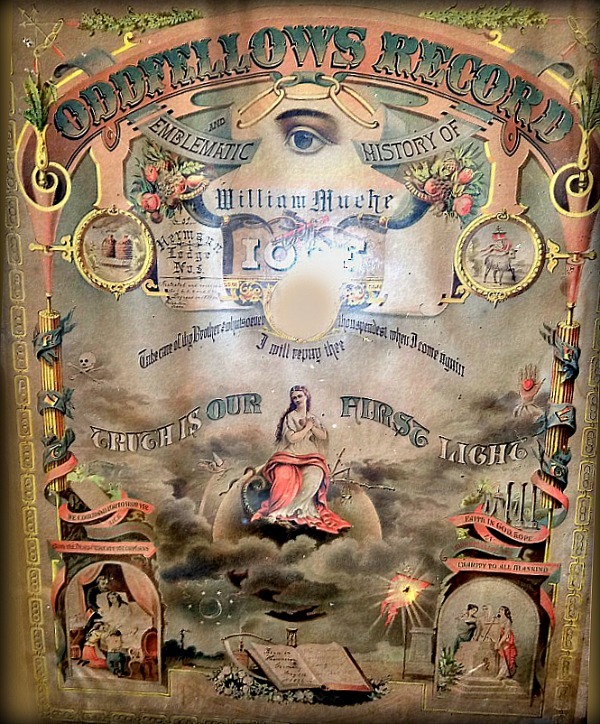 Membership certificate below was issued to William Muech who was a member of Hermann Lodge No. 5. The Herman #5 Lodge was instituted 01/29/1846 and consolidated on 03/03/1909 with Chosen Friends Lodge #6.